When your data is overdue for a backup, getting the job started is arguably more important than getting it done at the highest speeds possible. USB is the lowest common denominator when it comes to performance, and while the 750GB Buffalo DriveStation TurboUSB is not as fast as a hard drive equipped with FireWire ports, it is nonetheless well appointed to the critical task of preserving your precious data. The DriveStation looks fairly basic, with gray metal heat sinks framed by black plastic on the sides. Behind the square mirrored area on the face of the unit are red and green indicators that represent power and activity, respectively. Buffalo also provides a small connector on the rear for attaching an optional fan, though we didn’t find that the drive got particularly hot in our tests. 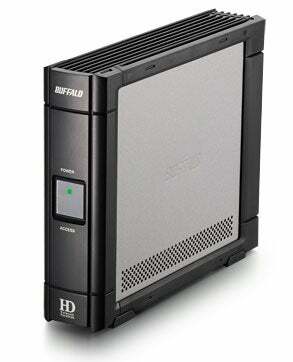 A fan is included with the 1TB version of the drive, but not with the 320GB, 500GB, or 750GB models. To set up the drive, plug in the external power supply, connect it to your Mac using the included USB cable, and flip the power switch. By default, the DriveStation automatically turns itself on or off whenever you start up or shut down your Mac. You can, however, change this behavior: a switch on the back allows you to keep the drive powered on independent of your Mac’s status. If you plan to use the DriveStation as a Time Machine backup volume in Leopard, you’ll need to reformat it using Disk Utility, as the drive comes pre-formatted for Windows. Or you can use the Memeo LifeAgent backup utility ( ), which Buffalo bundles with the drive. Buffalo claims that the DriveStation’s TurboUSB feature offers transfer speeds that are up to 37 percent faster than those of other USB models. We ran our benchmarks both with and without the TurboUSB driver installed but didn’t notice any effect on performance. It’s worth noting that Buffalo bases its performance claims on Xbench tests run in OS X 10.4.10 while our tests are real world application tests run in OS X 10.5. Still, the DriveStation did edge out other more expensive drives in some USB speed tests, beating the Wiebetech RTX100-SJ ( ) by 6 percent in the copy test and the Iomega UltraMax ( ) by 9 percent in the low memory test. In the duplicate file test, the DriveStation tied the 750GB Maxtor OneTouch 4 Plus ( ), but in the low memory test, it was 17 percent slower than the SimpleDrive USB 2.0 ( ), the fastest USB performer we looked at. Although the Buffalo DriveStation TurboUSB (750GB) offers just a single USB port and lacks the designer looks of certain other external drives, its value and price make it a solid candidate for your backup needs. If speed is not your primary concern, the DriveStation TurboUSB is definitely worth a look.